Modern or Contemporary…you choose. Quick and easy, this bed quilt makes a bold or serene statement depending on your color choice. 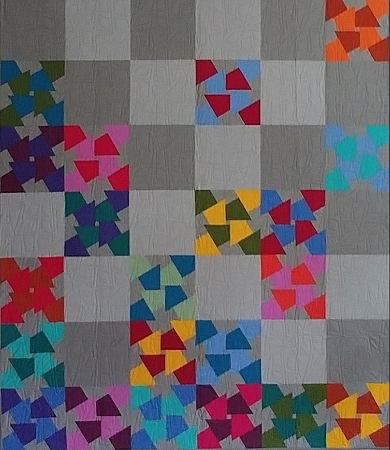 Learn to color balance as you make each Color Knot block. Fat quarter friendly or use 5” pre-cut squares. A background of two closely related solids creates intriguing negative space. It’s a fun weekend project. (2-1/2) yards Medium Gray, background.